How many times have you searched frantically for that TV remote control? Surely, no one in the house admitted they are the last one who used it! Wouldn’t it be nice and convenient if you could just “talk” to your TV and tell it what to do? Or, perhaps, to some other smart home devices too? Well, you can, and you will be surprised at what you can tell your TV to do, using your very voice. Fire TV Cube is Amazon’s revolutionary solution to eventually getting rid of that TV remote and, instead, control your TV (and other smart home devices) using your voice. As the name implies, the Fire TV Cube measures 3.4 inches wide by 3.4 inches long and 3.0 inches tall. It weighs 16.4 ounces and is available only in black color. It comes in the box with an Amazon Ethernet adapter, an Amazon Infrared (IR) Extender cable, a power adapter, 2 AAA batteries, and a remote control. The device operates with a Quad-core ARM Cortex-A53 1.5GHz CPU, Amlogic S905Z SoC, and Mali-450 MP3 GPU. The power of these combined technologies allows it to produce amazing pictures with its 4K Ultra HD, 60 fps, with HDR10 support at impressive load times. It also has a 16Gb internal storage and 2 GB RAM memory. It has four ports at its back: power, HDMI, Infrared, micro USB. 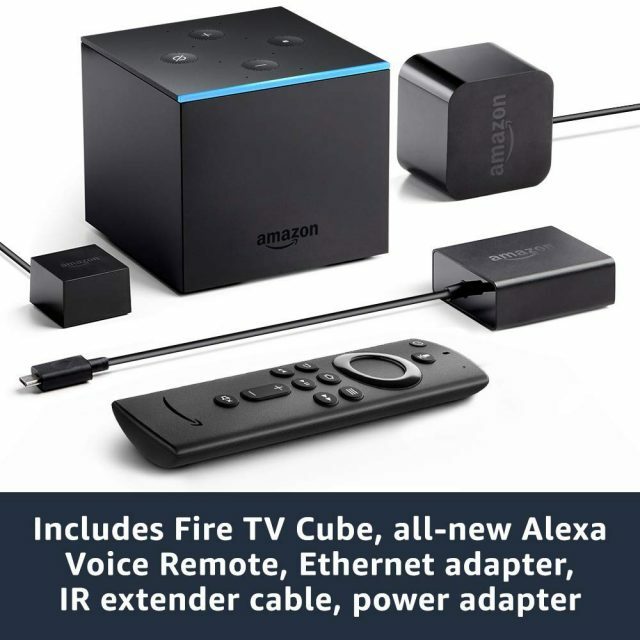 The Fire TV Cube features BT 4.2 and BLE technology for seamless connectivity to a wide range of Bluetooth devices (such as headphones, video game stations, speakers) and dual-band, dual-antenna Wi-Fi (MMO) for high-speed streaming, with less dropped connections. With its far-field, near-field voice recognition and beamforming technology, with eight built-in microphones, the Fire TV Cube can hear your clear instructions from anywhere across your living room. And with Dolby Atmos support, you are assured of clear, crystal sound. The Fire TV Cube features Amazon’s revolutionary voice assistant, Alexa, allowing you to control your TV, smart devices and also carry out other tasks using your voice. On the top of the Cube lies four control buttons for paging Alexa, raising, lowering and for muting the volume. A blue LED at the top edge of the Cube glows to let you know that Alexa is listening. For its TV streaming capabilities, for amazing pictures using 4K Ultra HD up to 60 fps with HDR10, and for Alexa voice controls, Fire TV Cube sells on Amazon for a modest price of just under $120, or 5 monthly payments of $24.00. 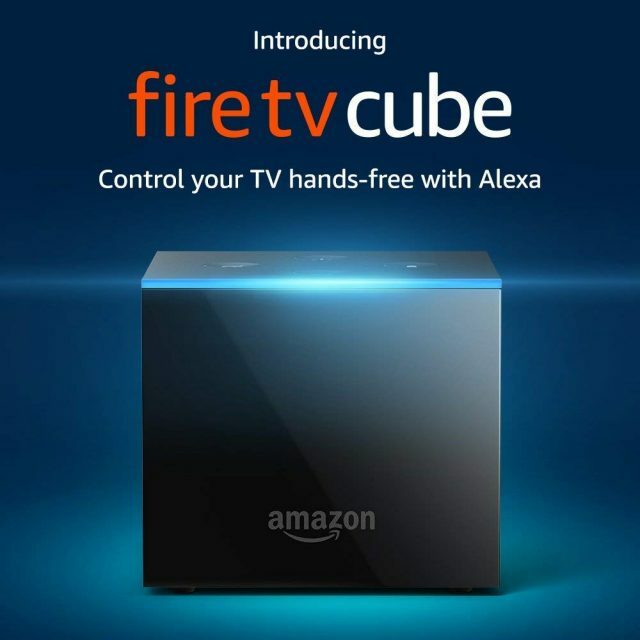 The Fire TV Cube is designed primarily to replace your TV remote’s control and enables you to control features of your TV, film and video entertainment using your voice to issue instructions through Amazon’s Alexa Assistant. Installation: Installing the Fire TV Cube is easily carried out in following simple steps: Place your Fire TV Cube not closer than 2 feet from your home speakers to avoid feedback and also not to overwhelm the Cube’s microphone. If you will be connecting the Cube to existing IR devices in your home, ensure they are in the line of sight of each other. Next, connect the Cube to the HDMI port of your TV (note an HDMI cable does not come with the Cube. You will need to purchase one). 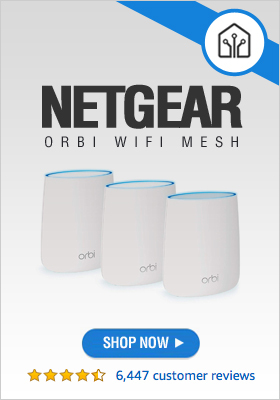 Now connect the Cube to your internet Wi-Fi. You will now be given on-screen instructions to follow and complete the setup, and following that, you are good to go. Voice Control Through Alexa: Eight built-in microphones, near-field and far-field technology allow the Cube to hear you from any direction. You can power on and power off your TV, increase, decrease or mute its volume, play films, movies, and episodes – just with your voice. You can also control a number of smart devices through HDMI-CEC, Infrared (IR) and cloud. You can connect the Cube to soundbars and A/V receivers (like Samsung, Sony, LG, Vizio and many more) and use your voice to control them. The degree of voice control varies across apps. Some apps allow limited voice control playback (i.e. 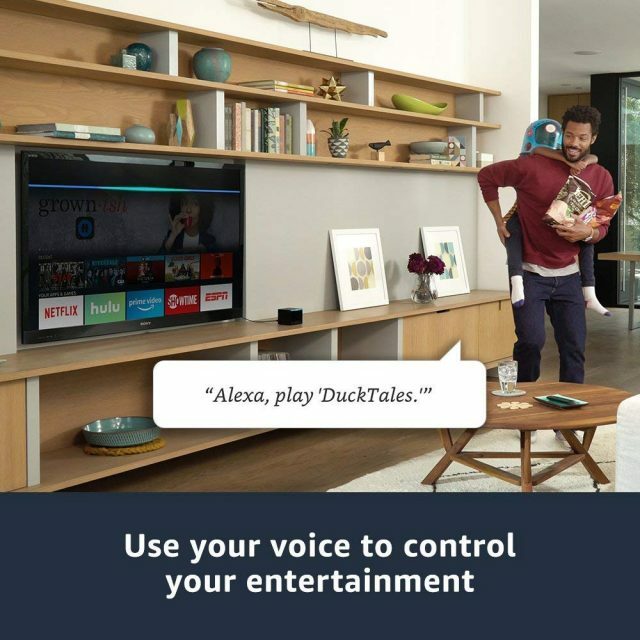 play, pause, resume) while other apps (such as ABC, STARZ, Netflix, Hulu, and ESPN) allows further voice control to browse, navigate and search. Fire TV Cube does not support Spotify for Multi-Room Music, Alexa Calling and Messaging and connecting to mobile phones via Bluetooth. Hand Remote Control: And for those circumstances when you might not be able to use your voice (or by preference), the Fire TV Cube comes with a remote control unit to operate the device. The remote control unit has a microphone and a voice-activate button with which you can still issue voice commands. It has navigation and playback control keys as well as Home and Menu buttons. 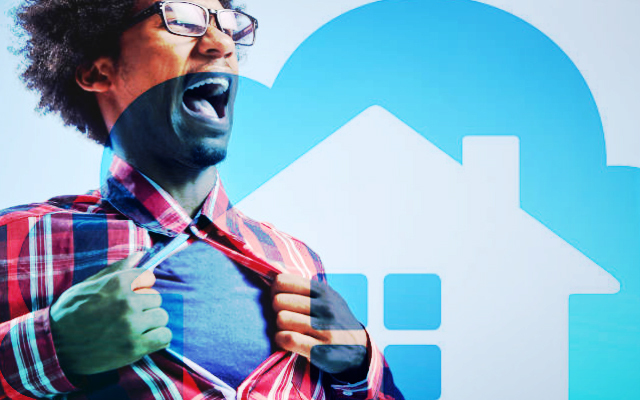 Enjoy Amazing Film and TV Entertainment: The Cube connects to and can control your live cable and satellite boxes (such as Comcast, DISH, DIRECT/AT&T U-verse, and more) by voice. You can watch over 500,00 episodes and moves, stream TV shows, movies, from Pluto TV (free), IMdb Freedive, and many others. 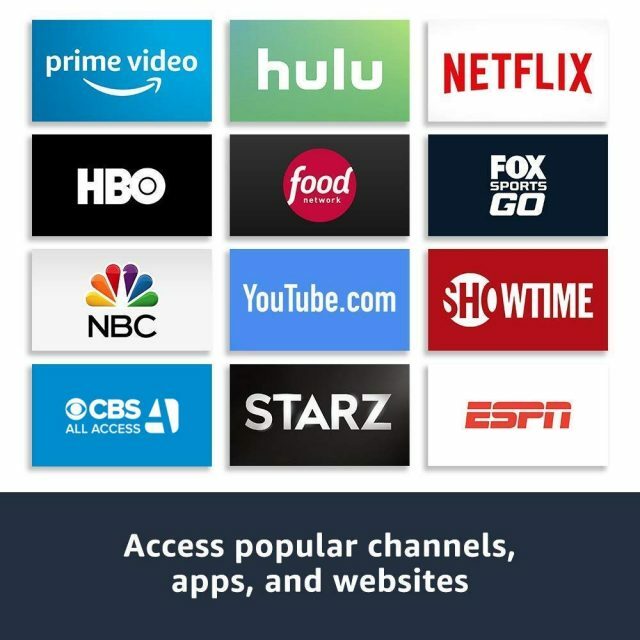 Enjoy your favorite shows and films on YouTube, Hulu, Netflix, Prime Video, HBO, and more. Using your voice, you can enjoy full playback control (such as search, select, play, pause, fast forward). With Prime membership, you can enjoy sports, movies, TV shows, live events, and more on Prime Video without any additional charges and on any compatible device. Prime membership also gives you over 100 additional channels (such as HBO, SHOWTIME, Cinemax, and STARZ without the need of a cable. Each channel offers you a free trial. Then, you pay only for those channels you desire and you can cancel your subscription at any time. Get your free 30 day trial of Prime membership now. Website Access: Visit your favorite websites such as YouTube, Facebook, Reddit using browsers such as Firefox or Silk. Music Streaming: Using voice, request songs by title, playlist or artist and control playback via Spotify, iHeart Radio, Apple Music, Pandora, and Amazon Radio. Amazon Music offers unlimited with a free 30 day trial period. Alexa’s Voice Control and Live TV streaming and Film Entertainment are strong suits of the Fire TV Cube. 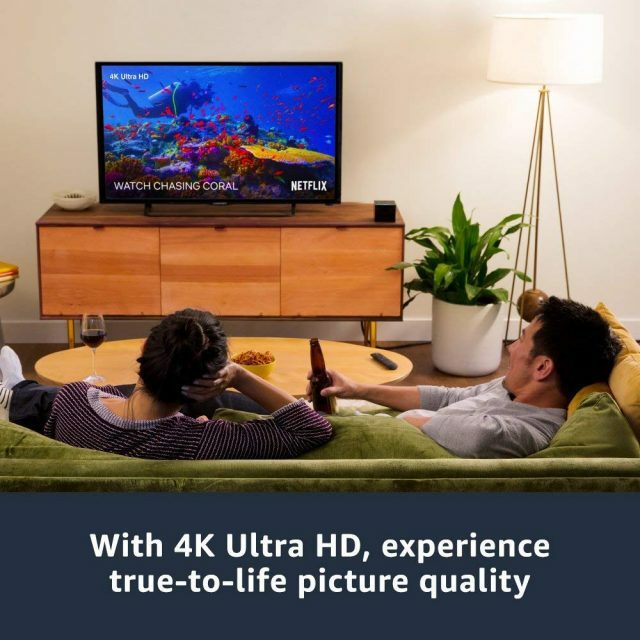 Add to that amazing 4K Ultra HD pictures, a huge library range of films, videos and music streaming services, Dolby Atmos sound, and more impressive features – all for your immense enjoyment and entertainment. And with Alexa getting more and more better in future with improvements, upgrades, and add-ons from Amazon, the Fire TV Cube will be a close companion in your home entertainment for some time yet to come.